World Record -- 40 lbs. 4 oz. This trout species is scientifically known as Salmo Trutta Lacustris and is VERY closely related to the sea trout (Salmo Trutta Trutta). Brown Trout are the REAL trout and are native to Europe, the western parts of Asia as well as the northeastern coast of Africa. Because of their great value as a sport fish (they taste pretty darn good, too! ), they have been introduced into waters all over the world. Do the math and you can figure out that the sport of fly fishing began with the Brown a half world away. Now the "Brownie" (as I like to call them) can be found just about anywhere that Brook Trout are found. As a matter of fact, Brookies and Brownies do not coexist well, and Browns actually thrive better in the absence of Brookies. Fresh water that is between 55 degrees and 77 degrees is the best environment for Brownies, and they can be found all over North America as a result. 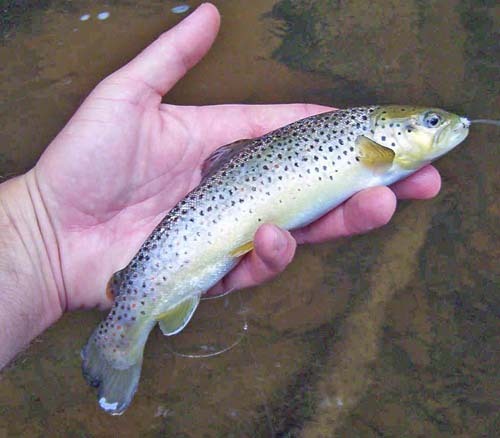 These original trout grow to a size that is dependent on the water they call home. A maximum weight of over 40 pounds is possible, but due to overharvesting and other factors, the average size is about 2 pounds. As witness, the world record is 40 pounds, 4 ounces caught in 1992 in Arkansas. Spawning takes place in rivers and/or streams much like salmon. A single female will lay as many as 2000 eggs per pound. So a big fat 10 pound female can produce up to 20,000 eggs. It is with a sad heart that I tell you the females will die shortly after laying the eggs. 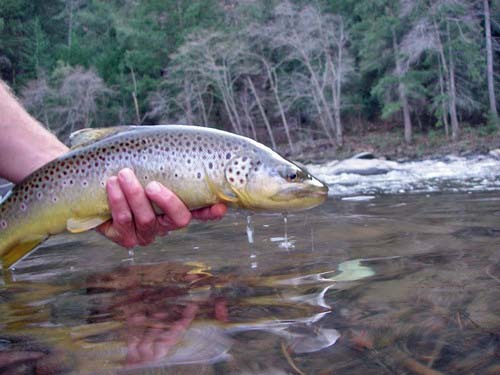 Brownies very seldom cross breed with other trout species and are, as such, the equivalent of aquatic bigots. 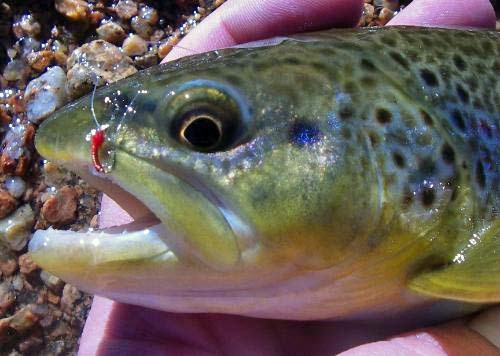 As with most trout are, our guys and gals are opportunistic eaters. However, the feeding habits vary with overall weight. The bigger they are, the more they eat, in other words, just like us humans. I wonder if there is a Brownie Weight Watchers program somewhere. Opportunistic feeders eat whatever they can, whenever they can. The diet of this fish is comprised of insect larvae, small crustaceans, and frogs. They are also a cannibalistic fish that will feed on smaller trout at any opportunity, resulting in a larger fish size. Cook ‘em like any trout. Bake ‘em, broil ‘em, fry ‘em or smoke ‘em. Any way at all, just eat ‘em up! A little seasoned salt and some cooking wine or sherry goes a long way to trout heaven. There are actually three separate variations of the Brown Trout family; salmo trutta lacustris (the original BT), salmo trutta truta (Sea Trout) and the salmo trutta fario (a second Brown Trout). The fario variation prefers colder waters and stays in upland streams whereas the lacustris Brownie is found in lower lying water areas. The trutta trutta (Sea Trout) is an old salt and takes residence in the ocean, but comes to fresh water to spawn every spring. Don't forget what to do after you catch him. You need to look him straight in the eye, give him a pat on the back, and say "You did a heck of a job, Brownie!!"